After four years of operating the Richmond Animal Shelter as a no-kill shelter, the Richmond Animal Protection Society (RAPS) is holding a special event on New Year’s Eve. On Friday, Dec. 31, from noon to 3 p.m., RAPS will have an open house and anniversary party to celebrate four years operating a municipal animal shelter under a no-kill policy of animal welfare and rescue, according to a news release from RAPS. The public and Richmond city councillors are invited to join RAPS in marking their fourth birthday by attending the open house and seeing what no-kill sheltering has done for Richmond’s homeless animals. Punch, cookies and other desserts will be served. A volunteer will provide guided tours of the facility. RAPS has operated for 21 years as a no-kill animal rescue organization, but in 2007 was awarded the contract by the City of Richmond to operate the city’s animal shelter and provide animal control services. RAPS promised the community they would change the municipal shelter to a no-kill facility, only euthanizing animals that are too sick or injured to recover or who are deemed too dangerous and unstable to allow them to live a quality life. Euthanasia is never used to deal with the massive animal overpopulation in Richmond including the abundance of homeless dogs, cats and rabbits. RAPS has also implemented innovative policies such as a low-cost community spay/neuter program for dogs and cats, dog training classes for the public, special reactive dog-training programs for volunteer dog handlers and worked to stop the retail sale of rabbits and dogs in Richmond. Year-end donations can be made to RAPS to support the no-kill sheltering policy in person or online at http://www.rapsociety.com or by calling the Richmond Animal Shelter at 604-275-2036. Three teachers and 19 MacNeill Secondary students have come up with a brilliant idea. While some students might prefer to play football or be a member of the chess club in high school, these forward thinking secondary students are members of the MacNeill Secondary Animal Rescue Club! The Animal Rescue Club started in September and, led by teacher Wayne Hirayama, the student club members learn about animal rescue by visiting local shelters and fundraising for animal causes. The club holds fundraisers by selling cupcakes, pizza or hot dogs at MacNeill during the lunch hour. 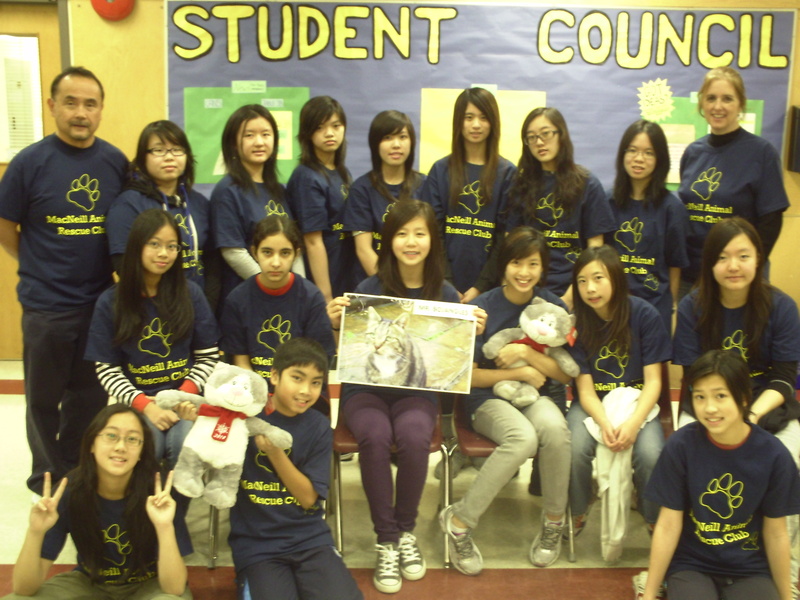 Since the club’s inception, the students have visited the BC SPCA Education and Adoption Centre, the Richmond Animal Shelter and the RAPS Cat Sanctuary which houses more than 900 cats and is the largest of its kind in North America. Hirayama says the students visit the rescue groups to learn about the incredible volunteer time and staff effort it takes to rescue, house, feed and care for so many homeless animals in our community. The mission of the Animal Rescue Club is to support those rescue efforts, and that’s exactly what the students are doing. So far, this year the students have held 10 fundraisers (about one to two per week), but during their visit to the RAPS Cat Sanctuary, the group found out about a very special cat in need and decided to dedicate their fundraising efforts to help him. Hirayama says the club’s motto is that even making a difference for one animal is a big difference. Well, that’s good news for Mr. Bojangles, a three-year resident cat at the RAPS Cat Sanctuary. This tabby and white feline often gets the attention of visitors to the sanctuary because he’s so friendly, but he also has strangely loud breathing. Unfortunately, in the last few months Mr. Bojangles’ breathing abnormalities turned into breathing problems, and he now needs some extra care from a veterinary specialist. The Animal Rescue Club decided this would be their next fundraising effort, and they are holding their weekly fundraiser and taking donations from the public to cover the costs of diagnostics to determine, and eventually treat, Mr. Bojangles breathing problem. It was clear to me when I spoke to Mr. Hirayama, that the members of the MacNeill Animal Rescue Club are dedicated to helping Mr. Bojangles and the cause of animal rescue in general, but Hirayama says the students are also learning the personal joy of giving back to the community and supporting the diligent efforts that go into animal rescue and care in Richmond. Members of the Animal Rescue Club will be fundraising for Mr. Bojangles for the next few months and invites the public to help out. If you would like to make a donation to help the Animal Rescue Club meet their goal, donations can be made at MacNeill secondary school office (6611 No. 4 Rd). 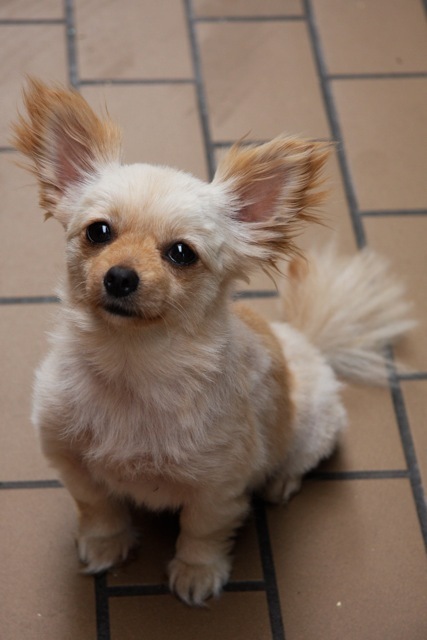 or at the Richmond Animal Shelter (12071 No. 5 Rd.). See letter in the Province. If you haven’t already heard, a new pet store that sells puppies, kittens, birds and other small animals will be opening in Vancouver’s Tinseltown this month. The store, part of a large chain of pet stores in our area, has made it clear from their website that they are stocking live animals for retail sale. While these plans have, no-doubt, been underway for a while, this comes right as the Richmond City Council has made the highly-applauded decision to ban the sale of puppies and dogs from retail outlets. And earlier this year, the Richmond councillors banned the sale of rabbits due to overpopulation of pet rabbits abandoned to Richmond’s parks. Vancouver-ites should be really upset that their city is continuing to allow retail and impulse purchasing of animals in pet stores. 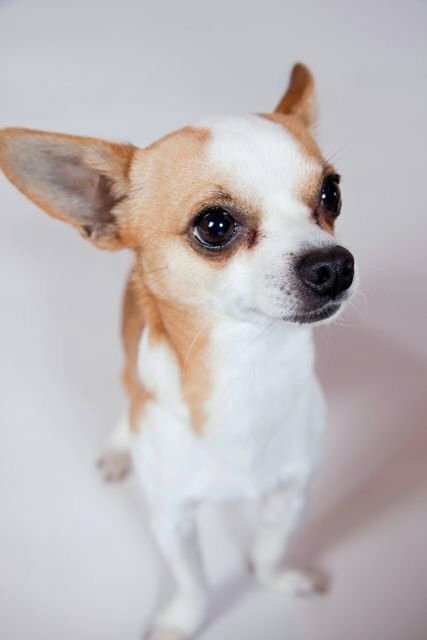 Not only have documentaries by the CBC’s Marketplace clearly shown that local pets stores such as Pet Habitat and PJ’s pet source their puppies from puppy-mills and puppy-brokers such as the Hunte Corporation, but the sale of dogs, cats, birds and other small animals in Vancouver will only fuel our on-going homeless pet crisis in this region. This costs the city of Vancouver to pay for ever more dogs to be housed at the Vancouver Animal Shelter and ever more cats and other animals housed at the BC SPCA. Meanwhile your local, independent animal rescue groups are packed full of animals that need homes, and a large percentage of those animals came from people who bought their pet at a pet store, and then gave it up because it was too much work. Richmond-ites understood the consequences of retail animal sales, and when Richmond Council asked for public consultation on this matter, the City received over two hundred pages of public support for the ban, and only two pages of dissenting opinion. I encourage residents of Vancouver and the Vancouver City Council to look at what your pet stores are costing you both financially and ethically. Milo the dog at the Richmond Animal Shelter has quite the story to tell of his recovery. Now, he needs a little help getting some hydrotherapy. Now that animal welfare is a part of mainstream politics (or at least it’s getting there), this cat takes a stand on the issues. See this wonderful column by Corry Anderson-Fennell.